When buying a new car, one of the first things that consumers look at is the fuel efficiency rating. They don’t really care so much about the engine that helps deliver that rating, with that magical final number being all that really matters. What they fail to realize once they buy the car with the great fuel efficiency is that how they look after it will have a real impact on whether or not the vehicle is able to deliver on those numbers. One area that is often overlooked are the tires, as they play a role in the fuel efficiency rating that your car will deliver. A great number of people are out there right now running around on underinflated tires and wondering why they have to visit the gas station on such a regular basis. Let’s face it, there’s a reason why the majority of gas stations have an air pump on site, but people only really pay attention when they have tires that are seriously flat. Imagine being able to check the air pressure on your tires and inflate them as needed, and all without hitting the gas station. That is exactly what you can do if you carry a top-rated tire inflator in the trunk of your Hyundai car. Portable tire inflators are a must have addition to your car tool kit if you are on the road a lot and concerned about the performance of your tires. The average car tire is not that inexpensive, so doesn’t it make sense to get the most out of your investment. Take a look on Amazon and you will see that tire inflators come in all different shapes and sizes, not to mention price points. All essentially do the same thing, but the higher priced units tend to be more efficient and come with a few more bells and whistles. A basic tire inflator will run somewhere in the $10 to $15 range, but don’t expect much more than a unit that plugs into your cigarette lighter to slowly supply you with the air that you need for your tires. The tire inflators at the top of the line usually come in at around $50 or more, but they have pretty much everything that you need to get your tire inflated and back on the road again quickly. The pricier units will likely have a tire pressure gauge built-in, with some units even having a digital display. They will also have 12-volt and 120-volt connections, allowing you to add air using your cigarette lighter, or a standard electrical socket. 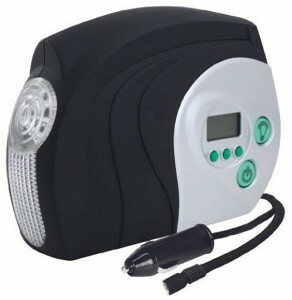 It actually makes sense to have both connections, as you can use the tire inflator in your garage or when you are stuck on the road with no outlet in site. The larger units will also have compressors that will get the air into your tire that much quicker, which is nice to have when you are out in less than pleasant weather. Tire inflators deliver air when you need it, and will give you some real peace of mind when you are on the road in your car.